July 4th 2005: It was a hot evening, and fireworks would soon be high in the sky. As farming takes no holiday, dairy farmer David Glamm was finishing chores when he was told his silo unloader had stopped working. David climbed to the top of his silo, and pushed the auger with his left foot. By the time he realized the silo unloader cover had rusted away, his foot was snatched from under him. He told his girlfriend to call 911. He screamed with pain and agony until the firefighters and emergency volunteers came to his rescue. Fortunately, David’s pant leg acted as a tourniquet, and he survived the trauma and unimaginable pain. As for his dairy farm business, it had no chance of surviving the blow. On August 1st 2017, David was able to share his story at a farm safety panel discussion coordinated by UMASH. With the help of different farming services, David is now able to support his finances and a flourishing crop farm. David’s story reinforces the dangers of farming to a person’s health and business. “In that split second, my life changed forever,” says David. 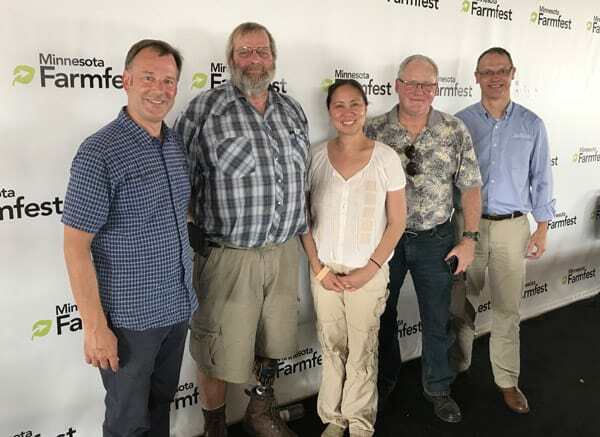 The panel discussion titled Farm Safety: Protecting You, Your Family, Your Visitors, and Your Bottom Line, was moderated by Minnesota Safety Council President Paul Aasen. David Glamm began the panel, followed by University of Minnesota Environmental Health Professor Marizen Ramirez, Occupational Medicine Physician Dr. Matt Keifer, and Northstar Mutual Sr. VP. Gary Metz. Panelist Marizen Ramirez provided insight on the issues of roadside safety. She reported that 47% of farming deaths are transportation related. This includes tractors, combines, and large machinery that drive alongside the interstate and busy roads. 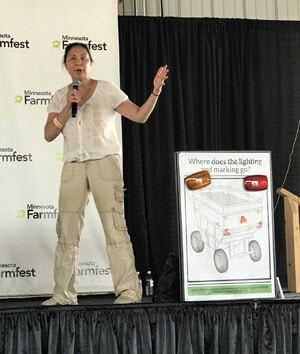 Using a visual display, Marizen pointed out the most effective way to utilize lights and markings on tractors, so they are more visible to drivers passing by. “The most effective way to prevent these roadside injuries is through education and awareness,” says Marizen. Dr. Matt Keifer took a different approach to farm safety. Dr. Keifer spoke about the effects of manure gases and the many detrimental health effects it has on farm families. According to Dr. Keifer, some farmers have been using gypsum as bedding material for their cattle; however, the hydrogen sulfide from manure and the gypsum compounds can create even more dangerous gases. Because children are smaller and naturally lower to the ground, they are especially susceptible to these potentially fatal gases. “Farmers are incredibly inventive, but they sometimes wander into areas that are a bit risky,” says Dr. Keifer. Lastly, Gary Metz spoke about the well-being of an individual’s farming business in regards to his experience working in insurance. “When farm safety is ignored, things can go bad,” says Gary, “and when things go bad, the claim can be bad.” According to Gary, business and personal life are intertwined in a farmer’s life, and by cutting corners on safety, both human cost and business costs are at risk. “Impact is personal because your farm is personal,” says Gary. The panel discussion provided a wide range of safety advice from people in the farming industry who see the implications every day. Paul Aasen began and concluded the panel by mentioning that safety is not something the farming community can take for granted. “A little time is all it takes to be safer,” says Paul. 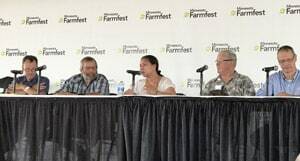 The panel discussion was sponsored by the Upper Midwest Agricultural Safety and Health Center (UMASH), the Minnesota Department of Agriculture, and the Minnesota Safety Council.